Would it all have been very different if the freak spin of a sliotar hadn’t ended Pat Hartigan’s career on mid-summer’s day 1979? Limerick were building solidly at the time, their five-time full-back a towering presence in a project designed to re-visit the All-Ireland peaks of 1973. A freak injury sustained during a training session left him without sight in his left eye, a personal trauma of immense proportions and also one which knocked the heart out of Limerick hurling that year. The squad regrouped in 1980 and went on to win successive Munster titles but further ambitions were twice thwarted by resurgent Galway, who beat them in the 1980 All-Ireland final and in the 1981 semi-final replay. Limerick seemed to be a magnet for bad luck around then. Hartigan’s forced departure robbed them on one of the best full-backs in hurling history, a loss which was acutely felt in all three games against Galway in 1980-’81. Suspensions and injuries – before and during the 1981 replay – combined to weaken Limerick to such a degree that it would have been truly remarkable if they had won. 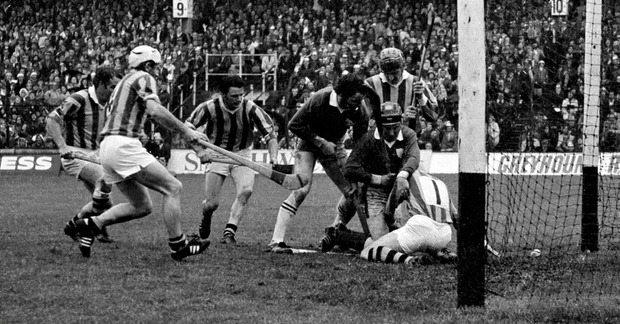 It was as if the gods had turned after smiling so benignly on Limerick in 1973 when Kilkenny were without injured duo, Eddie Keher and Jim Treacy, for the All-Ireland final. travails Since that September Sunday 45 years ago, good fortune and Limerick have remained largely estranged. Not that All-Ireland drought can be put down solely to that, since lots of other factors, many of their own making, have also contributed to the barren years. Indeed, it led to the production of a 400-page book by Henry Martin in 2009, with the title capturing the essence of the county’s travails. The 1973 All-Ireland success may seem a very long time ago, but even that masks another reality, which is that the Liam MacCarthy Cup has visited the county only once in 78 years. To put that in context, Limerick had won six All-Ireland titles by 1940, six behind Kilkenny and Tipperary and five behind Cork. Now, Kilkenny are on 36, Cork on 30 and Tipperary on 27 while Limerick have increased by just one to seven. It’s interesting that Limerick’s latest bid for glory pits them against Galway, who relaunched themselves as a major hurling force with the 1980 All-Ireland win. Almost four decades later, they again meet in the final, with Galway chasing the two-in-a-row and Limerick desperately trying to end the misery. It’s a topic where they are unquestioned experts. They have produced dozens of outstanding players in the intervening years but, for whatever reason, they never quite managed to complete the journey. Limerick started with successive Munster title wins and while they failed to advance it into All-Ireland glory in 1980 or 1981, there was still a high degree of confidence that they would remain consistent contenders. They won successive National League titles in 1984 and 1985, raising hopes that things were finally coming right. But on each occasion, they failed to even reach the Munster final. And, with no second chance back then, their seasons were over by mid-June. “We were the third best team in the country in the early to mid-’80s,” said Paddy Kelly, one of the stars of that era, in an interview in ‘Unlimited Heartbreak’. “I remember beating Kilkenny (All-Ireland winners in 1982-’83) at Nowlan Park in league games, but we never got a chance to take them on in the championship because we just couldn’t beat Cork. I don’t know if it was psychological or not. Limerick won only four championship games in the second half of the 1980s, which ended with a heavy defeat by Tipperary in the 1989 Munster semi-final. Just five minutes more and Gary Kirby will be on his way to the Hogan Stand for the presentation. Standing alongside him, Brian Whelahan is sensing the worst. Offaly are five points down in the 1994 All-Ireland final and playing like a beaten team. Green and white ribbons are being prepared for the MacCarthy Cup. The Croke Park exits are busy. Then came one of the most dramatic turnarounds in championship history as Offaly scored an unanswered 2-5 to win by six points. Two years later, it was Wexford’s turn to break Limerick hearts when winning the All-Ireland final by two points, despite being a man down for the entire second half after Eamonn Scallan was sent off. A second All-Ireland final defeat in three seasons sparked a serious internal row when manager Tom Ryan was presented with 20 questions by the county board executive as part of an end-of-year review. They started with: ‘Why did we lose the match’ and continued in a bizarre sequence which appeared to have no real motive other than to force Ryan to quit. He held his ground and led Limerick to a league success in 1997 but it wasn’t enough for the county board executive, who wanted a change. The man who delivered two Munster titles and a National League in four seasons was forced out. Limerick were so absorbed by internal squabbling that they probably didn’t realise the rest of the hurling fraternity regarded at them as a complete basket case. It wasn’t the only time that internal squabbling sucked much-needed energy from Limerick, much to the frustration of players and public alike. Three All-Ireland U-21 wins in 2000-’01-’02 sent Limerick’s stock soaring. Talented youngsters, combining with a solid nucleus of experience, looked like the perfect combination to drive them into a new world. It didn’t happen. Dave Keane, who had managed the U-21s to three-in-a-row success, took over from Eamonn Cregan as senior manager at the end of 2002, but lasted just one season before being voted out by the county board. Rumours of indiscipline were rife, although a clearly exasperated Keane denied it was a problem and suggested other undermining forces were at work. “Limerick senior players have no more of a problem with their social habits than any other county,” he insisted. “The kernel of Limerick’s problem with this and other issues was the willingness and eagerness of a player, or even some players, to go public. This drew national attention and magnified it out of all proportion. “It created the divide, ensured disharmony and inhibited me in my natural instinct in dealing with the team. “Such a fragmented team could not possibly develop the passion necessary to win. “Certain players were being advised from outside with a view to undermining my management,” said Keane shortly after his departure. Further instability followed, but four years later, Limerick had a good campaign which took them to the All-Ireland final. Unfortunately for them, it was at a time when the great Kilkenny team were in their prime so it was no surprise Limerick lost by seven points. That was as good as it got in a decade during which they had six different managers. 2010- 2018: LIBERATION AT LAST? The decade started in the worst possible circumstances when Limerick were forced to field a second-string squad in 2010 after mass withdrawals in protest at how Justin McCarthy had gone about omitting some players from the panel. It was an awful year for Limerick, who inevitably dropped out of Division 1. Indeed, it wasn’t until this year that they won promotion back to the top flight. Despite their unfortunate experience under McCarthy, Limerick turned to two more Cork managers, Donal O’Grady and John Allen, in quick succession. Allen presided over a first Munster title win for 17 years in 2013, but the success lost much of its lustre when Clare beat them in the All-Ireland semi-final before going on to win the title. Five years on, Limerick are back in the final for the first time in 11 years, led by one of their own and with a squad bristling with brilliant young talent from two recent U-21 All-Ireland wins. Once again, a county awaits. The last word in ‘Unlimited Heartbreak’ went to Eamonn Grimes, who captained Limerick to glory in 1973. “I would love nothing more than to see the scenes of victory in 1973 re-enacted some day soon in Croke Park. Is tomorrow the day that happens?